There are many definitions of an Earth-like exoplanet. Some say it’s a planet that orbits a star at just the right distance for liquid water to exist on its surface. Some say it’s a rocky planet, like ours. But determining if an exoplanet is truly habitable requires actually figuring out what’s on the planet. Currently, telescopes like the space-based Kepler (currently operating the K2 mission) can detect planets by the way they periodically dim the light coming from the star they orbit. Others, like the ground-based Very Large Telescope, have tools that can directly image exoplanets. Scientists are working on new telescopes that might be able to actually tell if these planets have life on them. They’re a while away, but astronomers can dream. Earth really is incredible, if you think about it. Aki Roberge, research astrophysicist at NASA, explained to me that it’s the only planet we know of where the presence of life has altered the atmosphere’s chemistry. If another Earth-like planet existed somewhere in the universe, we might be able to spot it by looking for a biosignature—spectral lines from chemicals like methane, water vapor, oxygen, or other organic molecules indicative of life. The issue is that present-day planet hunting tools just find the planets, but can’t really characterize what kind of stuff is on them. Scientists don’t have a tool that can do that, yet. NASA has proposed several new flagship missions, after the upcoming James Webb Space Telescope, that might be able to look for these biosignatures. These include LUVOIR (the Large UV Optical Infrared Surveyor) and HabEx (the Habitable Exoplanet Imaging Mission). 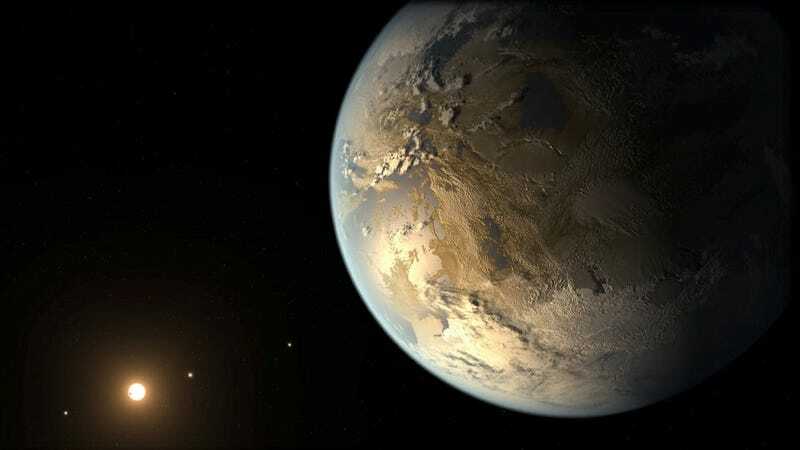 In the mean time, scientists must find more Earth-like exoplanets and figure out what biosignatures might look like. There are lots of different ones—in Earth’s history, its atmosphere probably contained different proportions of chemicals than it features today, for example. And looking for life on Jupiter’s moon Europa may vastly expand the idea of what a biosignature could look like. Scientists at the AAAS conference also discussed constructing Yale’s new ground-based exoplanet hunter, EXPRES, and NASA’s TESS, or Transiting Exoplanet Survey Satellite, slated to launch no later than June of this year on a SpaceX Falcon 9. Just yesterday, scientists on the Kepler satellites K2 mission announced 95 new exoplanets, with more to come as citizen scientists assist with analyzing the data. But this isn’t a guarantee. This week, President Trump released a proposed budget that would scrap the planned WFIRST telescope, a top-priority telescope that would have a field of view 100 times greater than Hubble’s. I asked Roberge whether a huge telescope like LUVOIR, twice the size of the James Webb Space Telescope, would ever get off the ground in today’s political climate.